I fell in love with the color turquoise at the ocean. The various ebbing and flowing of gorgeous color in the vastness of God’s creation is truly my happy place. So, it’s fitting that I now have this pretty blue art piece sitting in my living room. 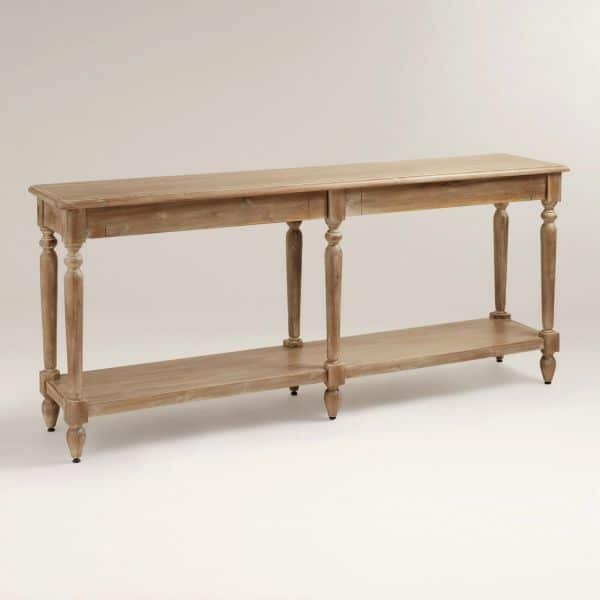 Maybe two years ago I fell in love with this console table. I mean, loved it. We already had a table for this spot under our gallery wall. It was Coach’s table when we got married and his parents had bought it for their home years before. It was a lovely table and served us well, but it just wasn’t my style and didn’t seem to be a perfect fit for this space. I spotted the Everett Foyer Table on a few blogs and thought it looked beautiful. I looked it up on World Market and measured out the dimensions. It fit my space perfectly. The length was just right and it was more narrow than the table we had. I had already been toying with the idea of taking down the gallery wall. I arranged it soon after we moved into this house with just the frames I had on hand. I didn’t have all white frames, or all wood toned frames. It was a hodge podge of white, black, wood, plastic, clipped frames and I’ve been wanting to do something a little more cohesive for a while. I also have been wanting to put up some new pictures. Best thing to do? Just take it all down and start over. I toyed with the idea of putting a mirror on the new table. But I have the huge mirror in the entry way just next to this space. And I don’t have much in the way of artwork, especially not big artwork. I didn’t have much to spend, but I remembered seeing this tutorial by my friend Sarah at Life on Virginia Street. 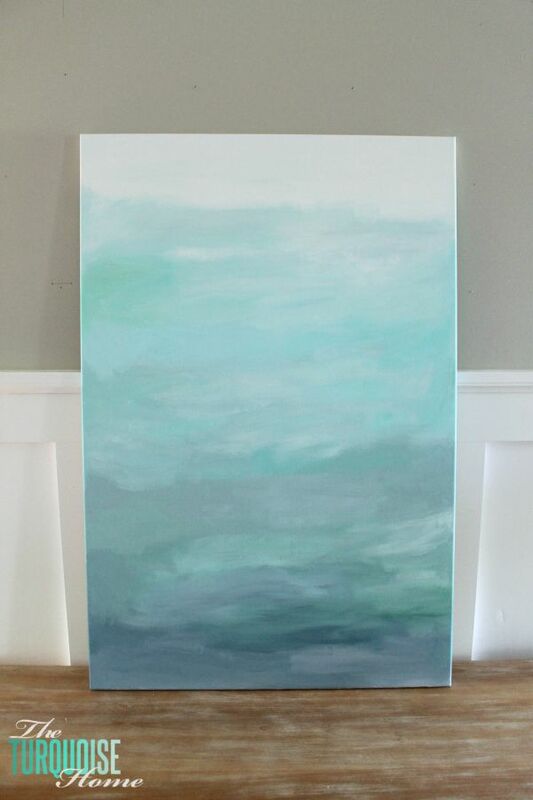 For this total project I spent around $22 with the paint and the canvas. The paint was 30% off and I used a 40% off coupon for the canvas – all at Hobby Lobby. I haven’t decided whether or not I’m going to frame it yet. 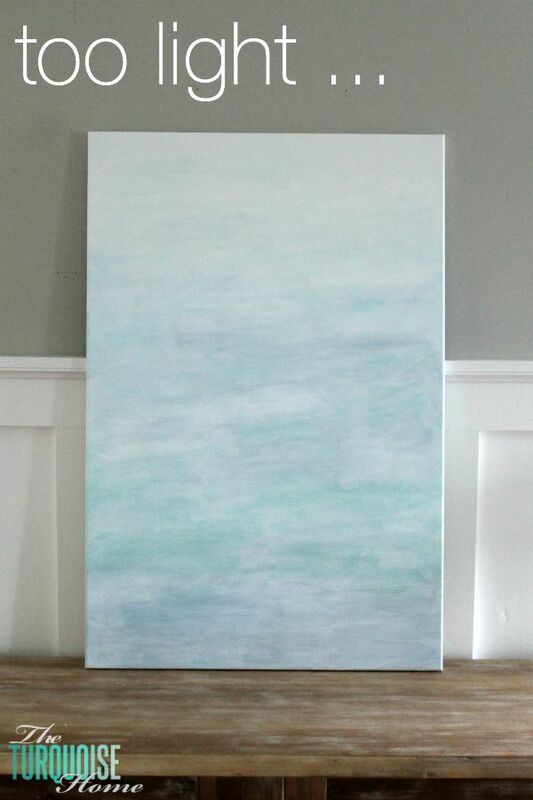 I painted the sides of the canvas, so it looks fine for now, but I think it will look more professional if I frame it. Miss A went back to preschool yesterday, so while Baby G was napping, I pulled out my paints and got to work. 3. 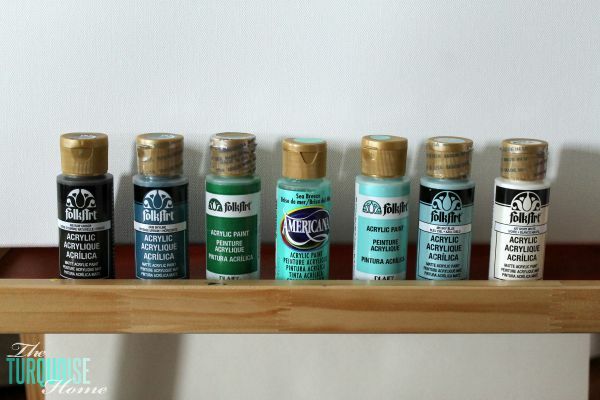 Brush – I used a 3/4″ fine painting brush, but you could use any brush, really. I made a mistake right off the bat. I was trying to figure out where to kind of start and stop each color. And so I painted a little of each color on the canvas first. You don’t want to do that. Start from the top or the bottom and work your way up or down, one color at a time. Sometimes I mixed the colors on the paper plate and other times I mixed them directly on the canvas. 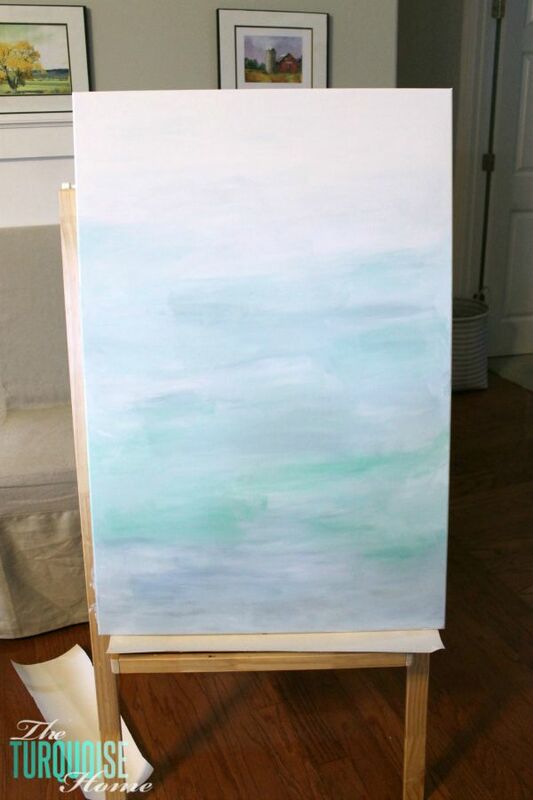 But the trick here is the keep painting while the paint is wet so that you can blend them. If they dry just a little bit it makes it difficult to blend the colors. My artwork went through multiple phases. At first I went heavy on the white and really did a light and bright painting. Then I went over that with a whitewash effect (watered down white paint). But that was too washed out for the space. So, I started over. And this time I worked my way from the bottom to the top and used a lot less white. I still used some, but wanted more of the color to shine through. 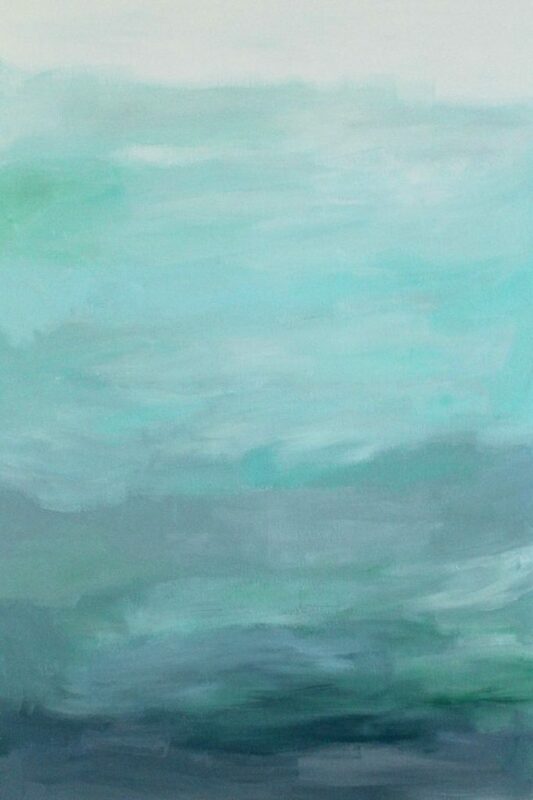 The beauty of a piece like this is that you can keep working with it until you get it right. There’s no timer that says you have to be done in a certain time, or that it has to look exactly a certain way. Get creative, be free. And if you don’t like part of it, start over or paint over that one spot. I will say that you should use caution when going back over a spot that’s already dried. I did that a few times, and it totally is noticeable to me. But it gives it uniqueness, so I’m good with it. Just be aware! And that’s all! I painted the whole canvas. Even the white part is painted in white paint with a touch of blue/green. 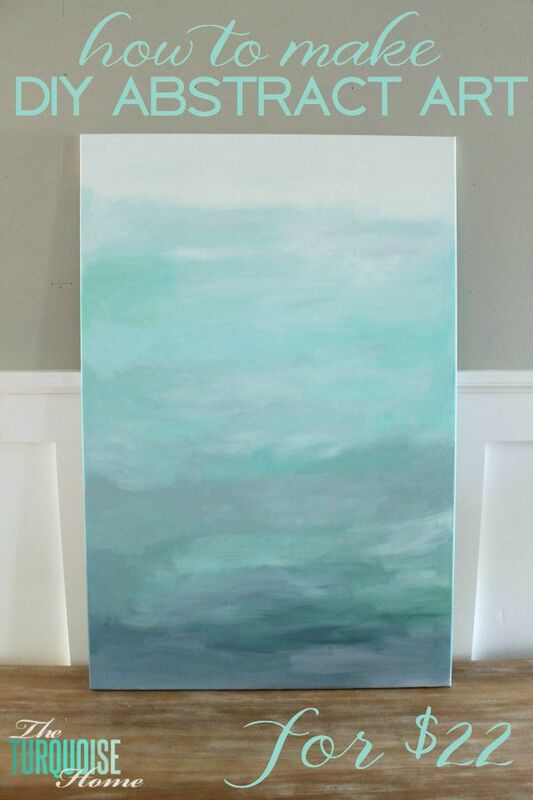 I love the colors and how they invoke the waves of the ocean. I personally think it’s just gorgeous. I can’t wait to style the rest of the table and figure out what I’m doing with that wall! Have you ever tried to create some DIY art? How did it go? Very cool. I like your style. I’d put that canvas in a black floating frame. Hi Laura, I am hoping to create something similar but am not very confident in my artistic abilities. Do you mind sharing your technique? Thank you! master college students, and visiting fellows https://math-problem-solver.com/ . Social Entities will not be common, they’re dependent on the society, culture and period that gave them start. 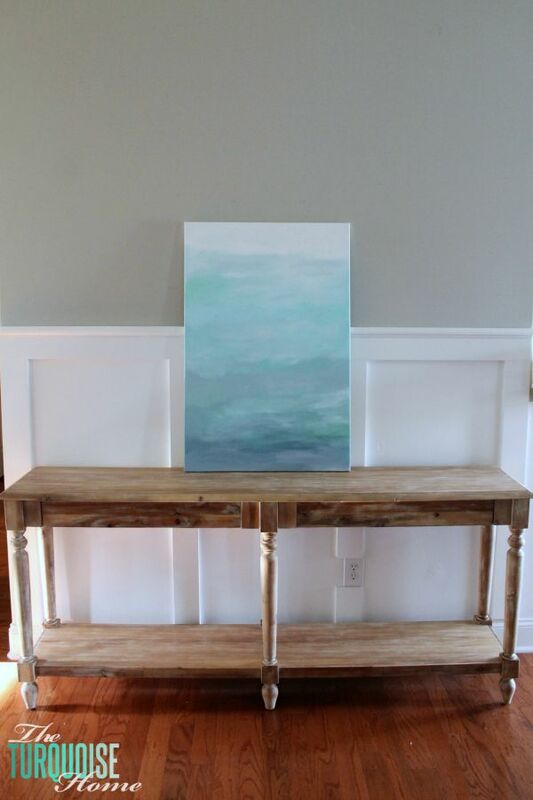 Laura, your artwork is so beautiful, and it pairs perfectly with that table! 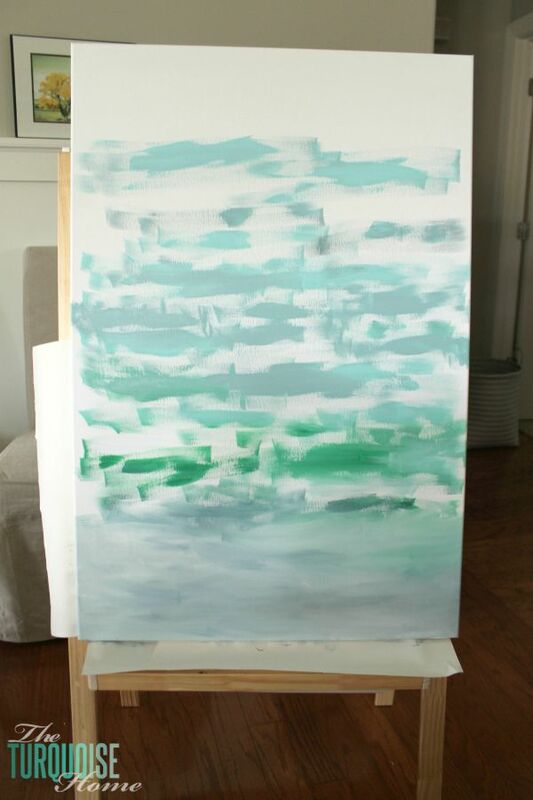 I love abstract painting like this because it’s so hard to screw up, especially with these lovely turquoise colors! Thank you, Emily! The painting pairs with the table better than I could have planned. Your painting is lovely. 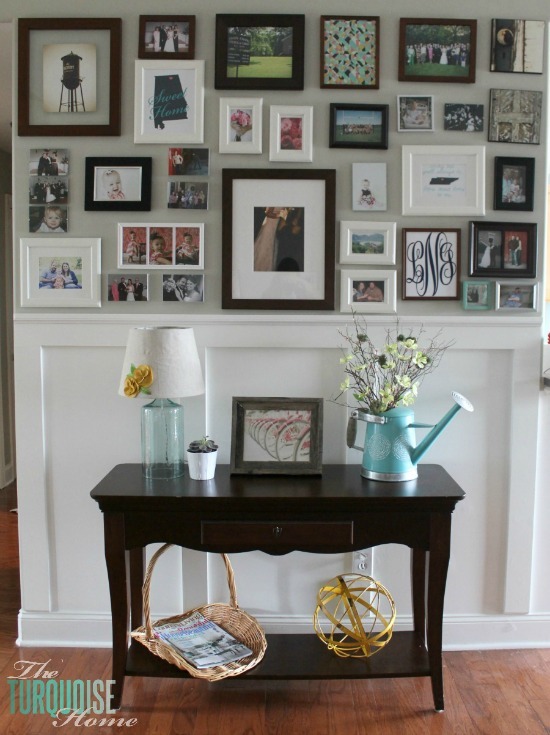 As for the mix matched frames on the gallery wall, just take them apart and spray paint them. I think white would look good on your gray walls. I have done that with plastic frames and it turned out well. Wow, I am impressed with your painting! Makes me think even I could do that. The table is fabulous. Can’t wait to see it “dressed”. P.S. I follow another blogger who loves turquoise. She even had her PT Cruiser painted turquoise. Her blog is theglamoroushousewife.com. 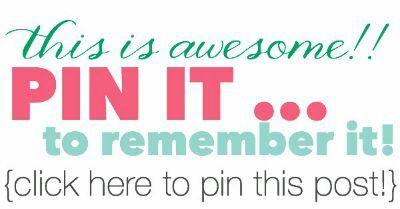 You totally could do it!!! I’m serious. Anyone can do this. Because of it’s abstractness, it’s almost impossible to mess it up!